Welcome to the fifth spoke on the Wheel of the Year. Hopefully, I’ll be back on track doing these at the start of the month and on time! We know that the central card is Major #14, Balance (or Temperance in RWS). Let me remind us what this year is about. It’s about keeping things in the middle and walking a tight rope: not pulling the silver birch one way or the other. It’s all about finding the balance between business, family, finances, TABI and me! That’s a lot to try and keep balanced! No more plates please ~ one has enough, thank you!! So the first up for this month is “Respect” in the shape of the Wildwood’s Woodwose. 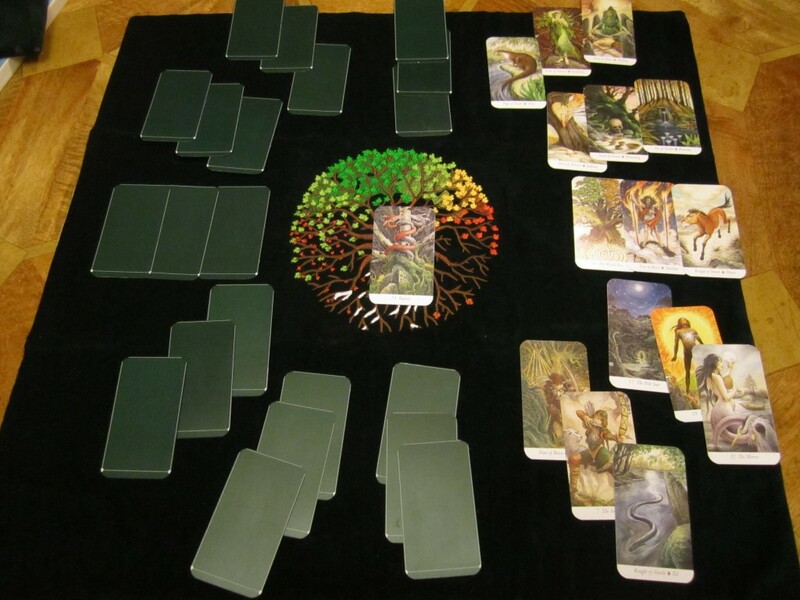 I’d never heard of a Woodwose before this deck, but I am getting familiar with him now. I struggle with this little fellow, and it seems that I am not the only one, going by the discussions on The Wildwood Study Group on Facebook. 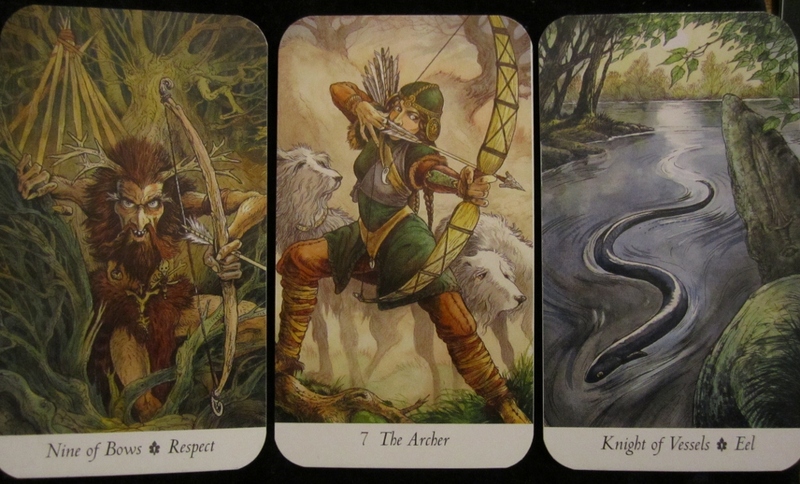 Then we have a Major, The Archer and finally the Knight of Vessels. I read the following for May: Earn and command the respect you deserve from all quarters during this month. If it means you have to be a temperamental old sod, then be a temperamental old sod. Decide on your target, calm yourself and when you are ready, let your arrow fly. This is the Chariot in RWS terms, so be driven, focused and aim your arrow true. Don’t get emotionally dragged into things or run away because the emotions overflow and threaten to drown you, as per usual. Acting like that will not help and you know it. In April, the month zoomed past in a sort of a blurry whirlwind. I recall it starting with Easter and spending time with my family and in-laws, now we’re in May and I am sure I must’ve blinked or something! I think I spent way too much time in April just reflecting, rather than actually doing things and being constructive and my usual self. But I’m Pisces, that’s part of what and who I am.